Is it reasonable, then, to expect a ripple effect in the U.S. economy when so many workers will have more income to spend in their home economies across the country? Short answer: Yes. But how those economic benefits are felt is dependent on a few key factors. No matter which economic modeling system you choose, there are constraining realities of economic theory which make measuring impacts of commodity price changes or their link to wages notoriously slippery. If an industry is highly automated or the output per worker is very high, then the economic impacts of a wage change will be much smaller than in industries which rely heavily on manual labor. Let’s consider two workers, one who operates an earthmover (Jim) and another who wields a shovel (Bob). Jim earned a certification and renews a license annually to operate his machine which qualifies him for higher wages. Employers who can afford it might hire Jim to do their digging because his output is so high compared to Bob’s. But if employers can’t afford Jim or if they’re keen to cut employee compensation costs to maximize profits (or for other economic ends), then they may opt to hire a team of Bobs. The ways in which Jim spends his wages may differ compared to a team of Bobs and ripple through their local economy in dissimilar ways. If you’re still thinking about Jim’s earthmover, check out our summary of skill-based technology change and how economies react to new tech in the workforce. The wage-price spiral is a catch-all for the more nuanced factors which, in aggregate, describe the relationship between wages and commodity prices. Generally, when wages change, so too will prices for those wage earners’ products. But businesses compelled to increase wages may not react by increasing prices. Businesses may absorb those costs by reducing profits (or, in some cases, fall back on government subsidies designed to stabilize commodity prices). Businesses might also reduce production, which, in turn, affects supply which can affect demand and… well, this is where the ‘spiral’ part comes in. On the other hand, workers who experience a wage increase may not all spend their new wages the same way. Amazon’s employees enjoy a 401K matching program as part of their benefits and may choose to contribute their additional income entirely to their retirement plans—in which case the induced economic impacts would be zero. The nature of any economic model is such that you will always see a positive return for any kind of new economic activity. 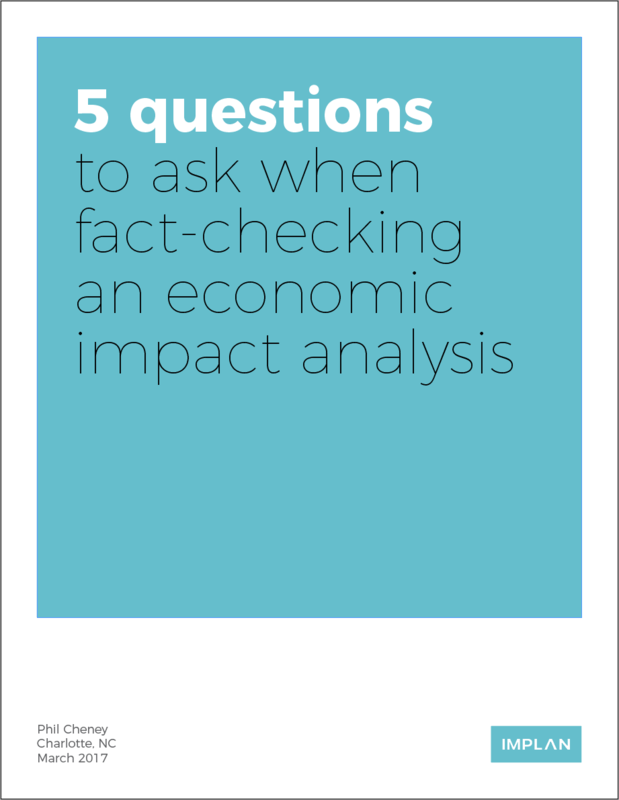 Broadening your assumptions, knowing the limitations of the model, and accounting for negative externalities while summing the net economic impact will get you closer to a real-world depiction of how an economy will react to a change in minimum wage. These will vary by region because of industry diversity and a population’s knowledge, skills, and abilities. A study from the University of California, Berkeley found that in the city of San Jose and in Santa Clarita County, raising the minimum wage would result in a negative net impact in the city on employment growth. Wrapping it up: Why are minimum wage analyses so rare? As alluded to above, there are simply a crippling number of variables to reckon with between wages changes and the elasticity of commodity pricing that it’s very near impossible to model this sort of economic change. This group publishes studies which tend to focus on economies contained in California. They’ve developed the UC Berkeley IRLE minimum wage model which they use in conjunction with IMPLAN data to estimate for a net effect on employment for an industry or region. They’ve also got a pretty awesome podcast. The institute spreads its focus across many economic topics and doesn’t limit its research to its home state. They’ve published a good amount of recent work to catch up on if you’re looking for interesting methodologies on the topic of wages. The GAO catalogues an impressive amount of research and follow-up studies which examine “how taxpayer dollars are spent and provides Congress and federal agencies with objective, reliable information to help the government save money and work more efficiently.” These studies often include detailed examinations of economies to identify the fundamental changes which resulted from policy decisions.